Water is essential to health. Water maintains body temperature; lubricates and cushions joints; protects the spine and other tissues; helps eliminate waste through urine, sweat and bowel movements; aids in digestion and absorption; and keeps skin looking healthy. At the cellular level, water maintains the balance of electrolytes and carries nutrients into and waste out of cells. A group of cell enzymes called protease (also called proteinase) require water for their work building amino acids. A loss or extreme reduction of water in the body can be deadly. The human body contains between 45 percent and 75 percent water, depending on age and body fat. In general, the bodies of babies and younger children contain up to 75 percent water, and elderly bodies may contain as little as 45 percent water. Water is critical to bodily functions ranging from digestion and waste elimination to cell functions. Even slight dehydration impacts bodily functions. Dehydration happens when the body doesn't have enough water and electrolytes to function properly. Water volume losses as small as 1.5 percent cause dehydration. Mild dehydration causes changes in mood, mental clarity and energy. Other symptoms of dehydration include fatigue, headache, increased thirst, low urine volume, darker urine than usual (the color of apple juice instead of lemonade), dry mouth, flushed skin, faster breathing and pulse rate, and dizziness. Severe dehydration can cause loss of consciousness and even death. Kidney disease has been associated with repeated episodes of heat-caused dehydration. Dehydration forces the heart to work harder during exercise. Strenuous exercise, especially in hot or dry weather, causes dehydration. Illnesses with vomiting and diarrhea also cause dehydration, as do certain medications. Even less-strenuous activities like surfing, yardwork, bicycling and walking may result in dehydration. Babies, younger children and the elderly are at greater risk of undetected dehydration. To chemists, "salt" refers to chemicals with a metallic cation (positive ion) or a cation derived from ammonium (NH4+) ionically bonded with an anion (negative ion). But for most people, salt refers to one specific compound – sodium chloride. 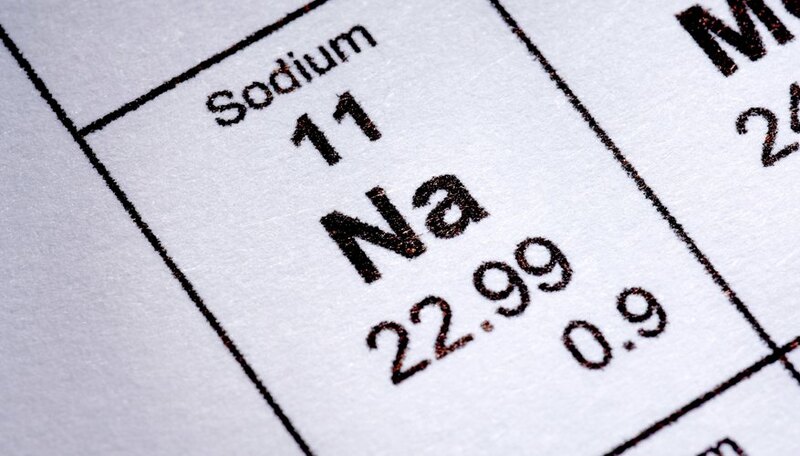 Many life functions require some salt, or more specifically the sodium. Healthy adult human bodies generally contain about 250 grams of sodium spread throughout the body, with higher concentrations in body fluids like blood, plasma, sweat, tears and urine. The sodium inside and outside of cells controls the water balance in cells. Water moves through cell membranes to equalize the electrolyte ratio on both sides of the membrane. Water moves from areas of lower electrolyte concentration to areas of higher electrolyte concentration in a process called osmosis. If fluids outside of the cell contain too much salt, water leaving the cell causes cell dehydration. The bloodstream carries excess water and electrolytes away to be eliminated from the body as sweat or urine. If the fluid outside the cell contains too little sodium, water flows into the cell. If too much water enters the cell, the cell can burst. Electrolytes including sodium, potassium and other ions transmit the electric impulses that control body actions, especially in the heart and brain. If electrolyte levels drop too low, these electric impulses slow and may even stop. Excess sugar triggers dehydration partly for the same reasons as salt. As the concentration of sugar increases, water moves out of cells to equalize the concentration of sugar outside of the cell. Loss of water inside cells reduces cell function. Too much sugar in the bloodstream triggers the pancreas to release insulin, which helps sugar pass into cells. Sugar provides energy for cells, but excess sugar is stored as fat. Metabolizing sugar uses water, increasing the body's need for water. Thirst indicates dehydration has happened. Rehydrate slowly so as not to trigger vomiting. Drink smaller amounts of water over a period of time, and try to drink cool water as that typically works best for rehydrating. Drinking salt water for dehydration essentially bathes digestive tract cells in sodium, which increases cell dehydration. Alcoholic beverages and sugary drinks like juices and soda do not work well for rehydration. The caffeine in coffee and tea may be mildly diuretic, but study results that looked at whether these two drinks were dehydrating have been mixed. If strenuous activity is anticipated, start drinking water before the exercise begins. Drink 2 to 3 cups (about 600 milliliters) of water up to two hours before exercising and another 3/4 to 1 cup of water 15 minutes before the activity begins. Continue rehydrating by drinking water every 15-20 minutes during the exercise. If the strenuous activity continues for more than an hour, consider a specially formulated sports drink containing electrolytes and salt water for dehydration. Continue drinking water after the exercise ends to gradually rehydrate. Although rare, excessive and usually very rapid water consumption causes a condition called hyponatremia. This condition occurs when the amount of water in the body dilutes the blood sodium level below 135 millimoles/liter (mmol/L). The first symptom, nausea, occurs because the stomach can't hold the excessive intake of water. BBC Future: Do Coffee and Tea Really Dehydrate Us? G, Karen. "The Effect of Salt & Sugar on Dehydrated Cells." Sciencing, https://sciencing.com/effect-salt-sugar-dehydrated-cells-20371.html. 19 November 2018.